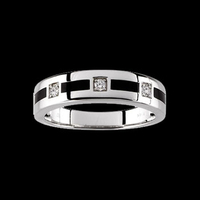 Handsome design 14k White gold, Onyx, and diamond wedding band. Diamonds are SI 1 clarity, H-I color and there are 3 in this great design. Genuine Onyx pieces accent the sides and top of this ring. Gram weight 7.4grams. Band measures 6mm wide on the top then tapers to 4mm at the back. 14k Yellow gold gent's diamond ring. This unique diamond ring is set with a 1/8ct tw round diamond and weighs 9.08grams. Available in your custom size but, Please note custom sized items are non-returnable. Gorgeous 14k two tone gold diamond watch design men's cluster ring. This ring is set with 4mm round center diamond surrounded with 6 3.70mm diamonds for a 1 1/2 total incredible diamonds. Fantastic ring weighs 20.55grams, Wow. You'll love this handsome Man's diamond ring. Stock size: 10 We're happy to size this ring for you but sized items are custom, non-returnable. Put your required size in the comment box during checkout. Sized items require additional time for shipping, 2-3 additional days. Men's handsome 14k yellow gold Onyx ring. This stylish ring weighs 7.74grams and is a stock size 10. Men's Gold Signet Ring. 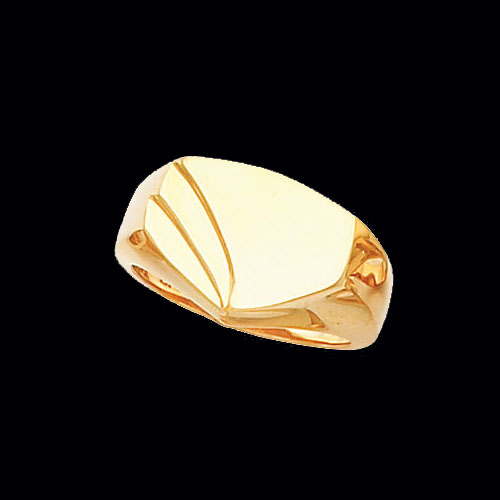 Handsome 14k Yellow gold mans signet ring with a fancy slant edge design. This Mans gold ring weighs 9.86grams and is a stock size 10. Ring measures 13mm x 12mm. Additional sizing available BUT, custom sized items are NON-Returnable. 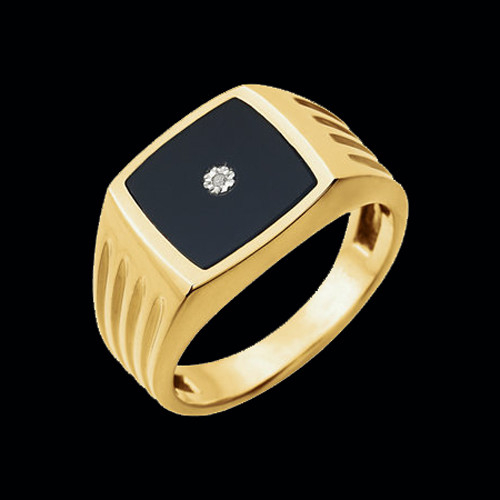 Gent's gold signet ring. 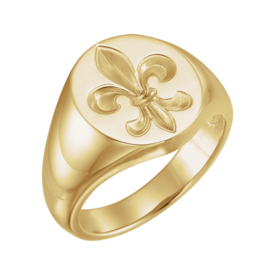 Handsome 14k Yellow gold mans signet ring features a beautiful Fleur-de-Lis design. Mans gold ring weighs 11.66grams and is a stock size 10. Custom sizing available - add your size to the comment box during checkout. Handsome 14k yellow gold genuine onyx men's ring. 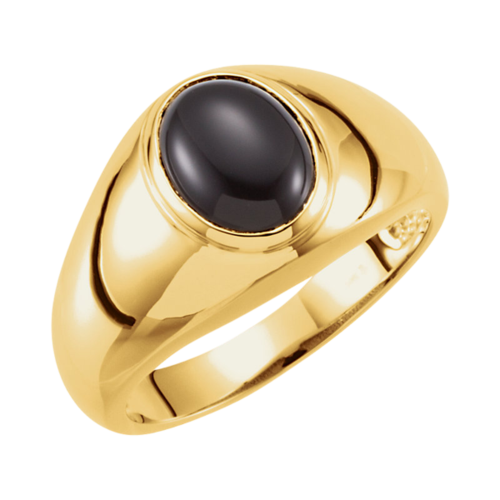 Black onyx measures 8mm x 8mm and this wonderful ring weighs 8.2grams. 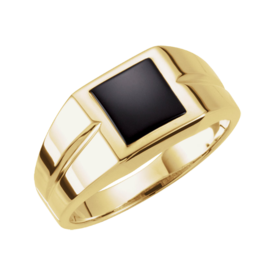 Onyx blends beautifully with gold in this men's ring. Stock Size 10. Alternate sizes available but considered custom and non returnable. Handsome Men's Onyx and Diamond ring. 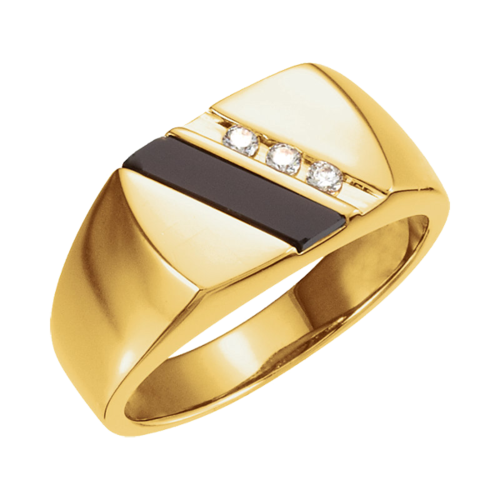 Very stylish Men's ring is set with a slanted black Onyx and 3 channel set diamonds totaling 1/10ctw. Order this ring in 14k Yellow or White gold. Ring weighs 11.02grams and is 10.5mm wide across the top. Diamond and Onyx Man's ring. 14K Yellow or White Gold Onyx and Diamond Ring is an always popular selection. Diamonds total 1/8ctw in this design. 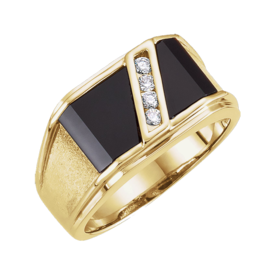 14k Gold Onyx ring. Large 12x10mm genuine cabochon onyx and 14k Gold make this a handsome ring for the distinguished man. Weighs 10.64grams. 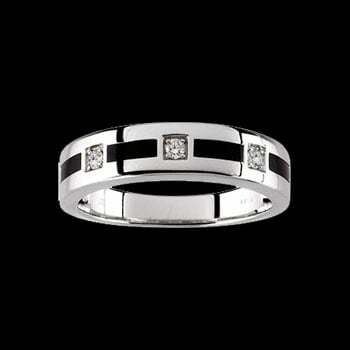 Very attractive 14k White Gold 1/4ctw diamond gent's ring. 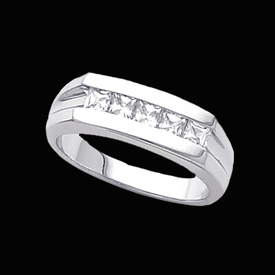 Diamond ring features a satin and polished finish, very sophisticated design. This men's diamond ring weighs 11.21 grams. The diamond is a 1/4ctw solitaire. 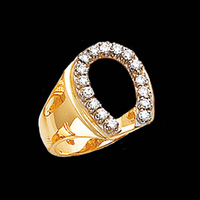 Handsome 14k Yellow gold Men's diamond horseshoe ring. 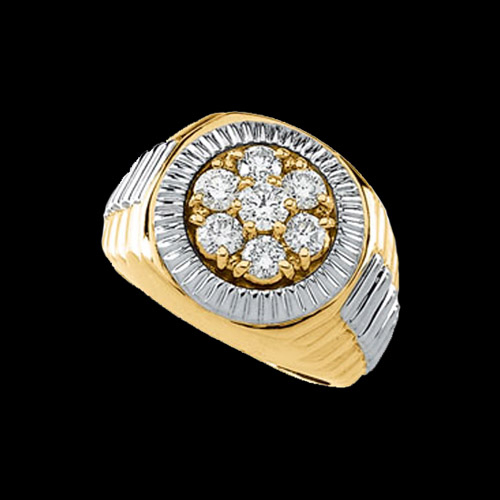 Masculine design ring is set with .45ct tw diamonds and available in a stock size 10. Whether you're an equestrian, from the west, or just have a little wild west spirit you'll appreciate this great lucky men's diamond ring. Magnificent Mens Diamond Ring. 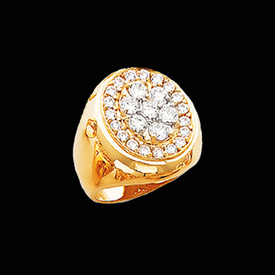 Bold Mens ring is set with an incredible 3 carats of diamonds in a circular pattern. Stock size 10, we are happy to size this ring for you free of charge. This handsome men's diamond ring weighs aprox. 9.80grams. **Special order this ring in Platinum or White gold, use our request email for pricing. 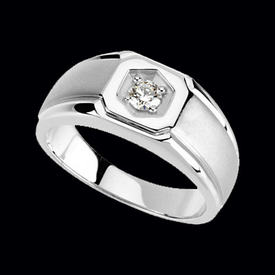 Platinum Men's Diamond Ring. 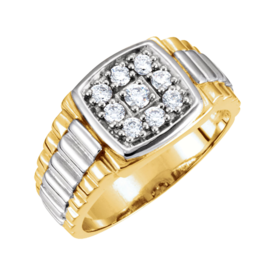 Diamonds are channel set in this lovely men's ring. Each diamond is about 3mm, aprox. total of 7/8ct tw. Diamonds are square and SI 1 clarity G-H in color. Gram weight for this ring is 13.5grams. 14K Gold with a 1/2ct. SI 1 quality G-I color Diamond. This Masculine Ring is 12mm wide and tapers to the back. Weighs 11.87grams. Very Nice Style. Handsome 14k Two Tone gold gent's diamond ring. This ring holds 3/8ctw diamonds in the center square design with a watch band shank. This ring weighs 9.66 grams. Fantastic very handsome ring. Finely crafted timeless design men's large oval gemstone ring. You'll love this rich bold design. 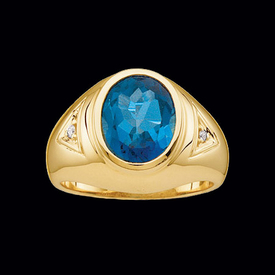 Our price shown is for the 14k yellow gold ring set with a swiss blue topaz and diamond accents. The gemstone center measures an incredible 12mm x 10mm oval, a 6 carat gemstone. This ring is custom made and we are happy to make it your way, you pick the metal, you pick the gemstone. We have many gems listed but if we are missing your favorite stone let us know, we'll get you a price on it in this great men's ring. This handsome ring weighs 11.4grams. Mans Diamond Ring. 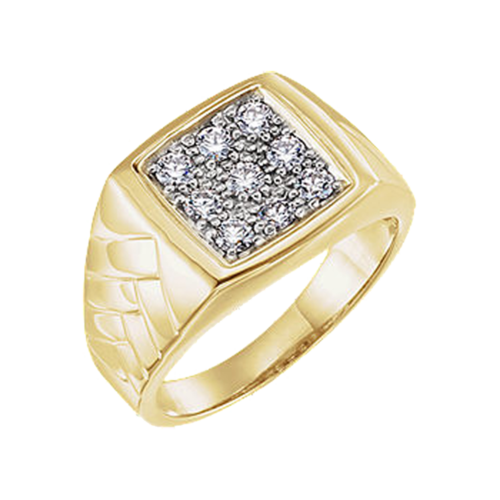 14K Two Tone White and Yellow Gold Masculine Gents Ring with 1/3ct tw Diamonds. Diamonds are I1 quality G-I Color. A Very handsome Ring!!! 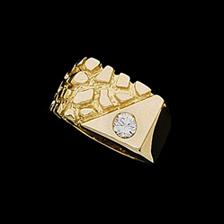 Handsome design 14k Gold Diamond gent's ring. This ring is set with 5/8ctw diamonds. Ring weighs 10.81 grams. This gent's diamond ring is a very sophisticated design, it will allow you to express your style with a simple flash. 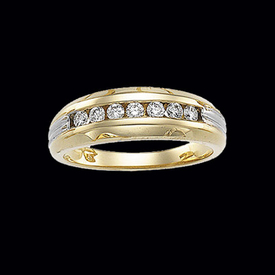 We are able to customize this ring in 14k white, 18k yellow, or Platinum.